An intuitive mouse and menu interface with high-speed graphics routines. Complete waveform editing, including cut, paste, copy, mix, draw, optimize, reverse, compress, invert, crossfade, undo and more. 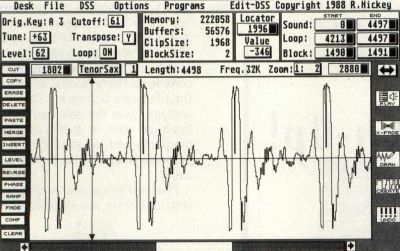 High-quality sample playback through the Atari ST speaker, allowing the user to hear edits immediately. Complete DSS-1 system in RAM, which holds with up to 16 multisounds, 256 samples and 64 programs instantly available. Full-featured patch editing that edits all DSS-1 parameters with two banks of patches in RAM and complete librarian functions, as well as a patch generator. Edit-DSS can be run on both monochrome and color systems, but it does require one megabyte of RAM. It's priced at $250.